Among the notable developments with the D5, Hangst finds the redesigned AF system—which now has 153 focus points, 99 cross-type sensors plus a dedicated processor—to be outstanding. The camera is equipped with a dedicated AF processor capable of rapid calculations. This processor brings superior AF response that is primed to constantly assist a photographer while tracking using multiple focus points—such as when following a soccer ball being centered by one player and concurrently keeping focus on another player as he heads towards the ball. Additionally, a new AF algorithm efficiently coordinates a range of processing operations, including advanced subject detection and detailed scene analysis. The algorithm enables precise AF tracking of moving subjects during 12 frames per second (approximate) continuous shooting. The superior AF performance during high speed continuous operation is refined even further when paired with the latest NIKKOR super telephoto lenses. “Not only do I notice an across the board boost to AF performance, but also dramatic response improvement when working through challenging moves or low light situations. This camera will increase the chance of getting that one frame, that one shot,” he asserts. “AF is extremely fast and very accurate.” Hangst also calls out the camera’s extended ISO, plus its high rate of frame capture per second, to be significant upgrades. A competitive athlete himself, Hangst has covered seven Olympic games and has worked for Deutsche Fussball Liga (DFL), Wimbledon and other top sporting organizations. During launch planning he toiled aside the Nikon creative team to develop imagery from soccer, water polo and gymnastics environments. The Nikon D5 captures at 12 fps continuous while experiencing full AF and AE performance, and up to 200 shots in a single burst. That’s a dream to a sports photographer. His photograph above was created in Manual mode, ISO 400, shutter 1/4000. An aperture of f/4.5 was set with the AF-S NIKKOR 600mm f/4E FL ED VR. The Nikon D5 was dialed to Dynamic-area AF using 25 points to track erratically moving subjects. During each day of capture Hangst consistently acquired files that displayed balanced and neutral color. The D5 incorporates a highly refined 20.8 MP Nikon FX-format CMOS sensor. This sensor yields rich tonal gradations, plus a refined signal-to-noise ratio, both of which contribute to outstanding image quality at high ISO sensitivities. Courtesy of the EXPEED 5 image-processing engine, ultimate detail reproduction is rendered straight out of the camera when capturing high-quality JPEG pictures required by media outlets. “Despite the varying locations and themes, color reproduction is faithful. Further, you witness a great balance from bright to dark areas.” Impressive to the photographer was also seeing how skin tones appeared within his poolside shots. Even with strong environmental influences, such as reflection, droplet spray and the cast from blue water, tones showed solid results with no issues. For a third image (above), the team staged a dimly lit gymnastics venue with a black backdrop. Hangst’s technical objective was to showcase AF prowess when shooting at high ISO. “The D5 expertly locks in on constantly moving subjects and keeps them in sharp focus. The image showing a gymnast aside the parallel bars was selected for its grace and sharpness in very low light. It was captured using a fast shutter speed of 1/2500, ISO 6400, Dynamic-area AF with 25 points and an aperture of f/3.5. Choice of lens was the AF-S NIKKOR 200mm f/2G ED VR II. With extended ISO I can freeze super fast action even when working in low light conditions. I observe a 1 to 1.3 stop exposure improvement in high ISO performance. This opens the potential to work at faster shutter speeds and/or try lenses that I couldn’t use before when I was shooting in limited lighting settings. The camera delivers balanced and correct color reproduction. Color is accurate and there is a smooth range from bright to dark areas. The D5 will give me new views and moments to capture because I may now work with different glass. 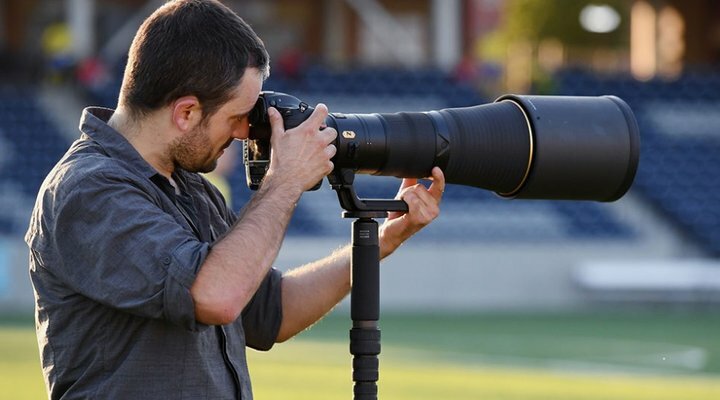 Matthias Hangst is an award-winning sports photographer, capturing images at the Olympic games, men’s and women’s FIFA World Cup Finals, DFL, FINA, Wimbledon and numerous other major international sporting events. He creates advertising campaign photos for global brands and produces regularly on behalf of sponsors and organizations. In May 2014, he signed as a staff photographer with Getty Images. See more of his work at www.matthiashangst.com.